The Gallup poll has released some results (“Republicans Turn Against John Roberts, U.S. Supreme Court“) that suggest that Republicans and Democrats are roughly equal in how blindly partisan they are. According to Gallup’s results, Republicans turned against the Supreme Court in nearly identical numbers to Democrats embracing the Court. If you were looking at the overall numbers you would only see that approval of the Supreme Court was the same before and after the decision on the Affordable Care Act (55%) while disapproval had gone from 40% to 45%. However, shifts on opinions on the court are evident once you look at people from each party. Republicans initially assumed that Chief Justice John Roberts was wonderful with 67% of Republicans holding a favorable opinion of him and only 4% having an unfavorable view. Now, the Chief Justice’s is viewed unfavorably by 44% of Republican and favorably by only 27%. Democrats started out more balanced on Roberts (35% favorable, 31% unfavorable), but have recently seen the light with 54% of Democrats now viewing him favorably. Republicans have gone from their default assumption about anyone they know little about (“Any Republican must be okay”) to a new assumption based on the only court decision most of them are aware of (“Anyone who disagrees with me on health care is bad”). Neither view does John Roberts justice (pardon the pun). John Roberts has disappointed the base of the party that spawned him. That’s what justices do from time to time. If the founding generation wanted all of our decisions on rights based on public opinion they would have made judges subject to election and never bothered with the Bill of Rights. 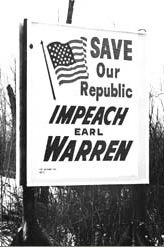 I remember the signs up all over the south calling for the impeachment of Earl Warren. The Court will be dragged into the great issues of the day and sooner or later they make someone mad. For me, the problem isn’t that John Roberts made an argument contrary to the base of his party. The problem is that other justices, President Obama, Mitt Romney, and a host of congressional leaders seem afraid to exercise leadership and try to persuade members of their party on a major issue. I may not agree with Roberts’ argument but I respect his willingness to make it. Only time will tell whether Justice Roberts goes on to be a great leader of the court or a huge mistake. However, reaction of partisans to his vote on the health care decision tells us more about our partisan assumptions as the Chief Justice’s legal reasoning. So, don’t take your opinion on the court’s decision too seriously. 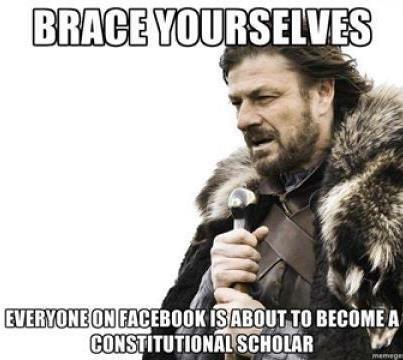 Chances are that it’s largely an echo of your partisanship.